Red and gold leaves and a slight chill in the air are all signs that fall is upon us. It’s time to prepare for the change in season, holidays, and all the joy that comes with them. With all the hustle and bustle, taking care of your skin can sometimes be difficult. Juggling school activities, office parties, and other responsibilities can easily take precedence over skincare. However, now is the most important time of the year to set up a proper skin care regimen and stick to it. With the fall comes cooler, drier air that can damage your skin. Follow these fall skincare tips for truly radiant skin all year round. This may seem a bit silly, but the best way to stay on top of your skincare needs is to make a plan before you are bogged down with responsibilities. You can write it on a small calendar or keep it in your phone, but scheduling out your skin care plan will save you a lot of headaches when you get busier later in the season. Also, it will be easier to remember what skincare steps you need to take if you follow a set schedule every week. The cold weather not only brings changes to the environment, it can bring a change to your skin type as well. It is not uncommon for oily skin to become more normal and for normal skin to become dry. This is because the air you are in contact with day to day is drier. The heaters in your office and home pull the moisture out of the air and your skin and the cold air outside will zap your natural oils away. Check your skin when the weather starts to get cooler to see if there is a change in your skin type. If you see a change, go see your esthetician or skin care professional. They will be able to help you determine what your skin needs to stay healthy during fall weather. The best way to keep dry skin away during the fall is to moisturize daily. The best time to do this is right after you take your shower in the morning. That way you can lock in all the moisture you gained from the shower with your moisturizer. Sunscreen is just as important in the fall as it is in the summer. Even though you can’t feel it as much, the sun is still there and poses a risk of damage to your skin. Continue to protect your skin during the fall with a sunscreen that has appropriate SPF protection. You can meet your moisturizing and sunscreen needs during the fall with our Prevention+ line, which provides hydration and built-in broad spectrum UVA/UVB sun protection. 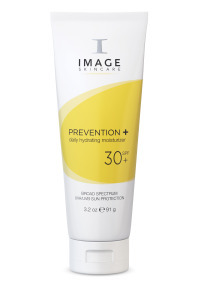 For instance, our Prevention+ daily hydrating moisturizer SPF 30 is applied to cleansed skin once in the morning and every two hours or as needed when spending time in the sun. It is excellent for dry or dehydrated skin, sensitive skin, and customers with rosacea. Best of all, our daily hydrating moisturizer SPF 30 is paraben free. It is also enriched with vitamins, antioxidants, and green tea for anti-inflammation. This moisturizer will keep your skin hydrated and protected from the sun. Using Prevention+ and sticking to the above fall skincare tips will keep your skin ageless all season. You can find an IMAGE Skincare distributor near you for more information or call us at (800) 796-SKIN.